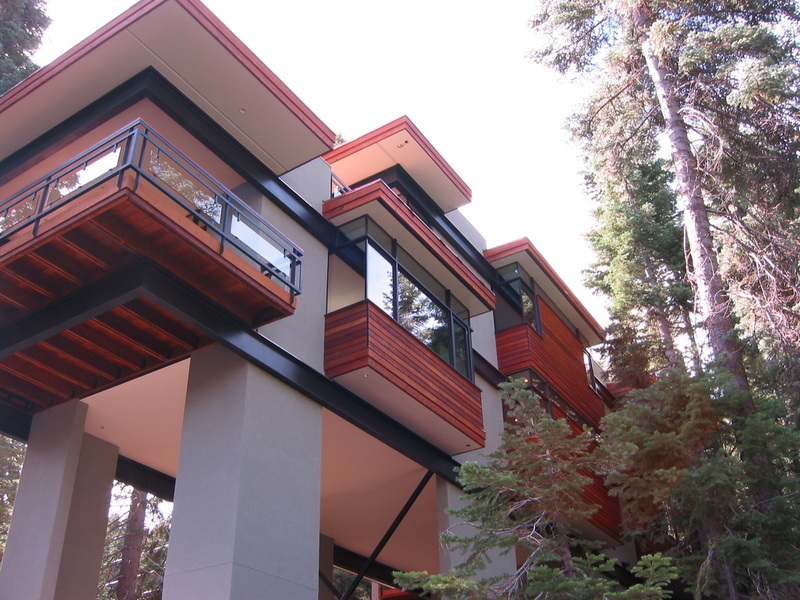 Designed by Joel L. Sherman, Architect, JLS Design, it was meticulously crafted by Jon Traeger, Norwegian Wood Construction Co., over a six-year period. Every detail of construction was built to be seen. 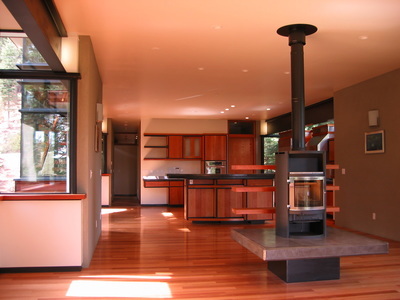 Contemporary in design, its goal was to float in the trees, and interior cabinets and hearths reflect this concept. Ten-foot ceilings on both levels enhance the spaciousness of this distinctive low-maintenance residence. The exciting architecture is evident the moment one views the house on approach. The exterior entry bridge, level driveway, entry planter box and integrated garage doors indicate that a unique experience awaits. 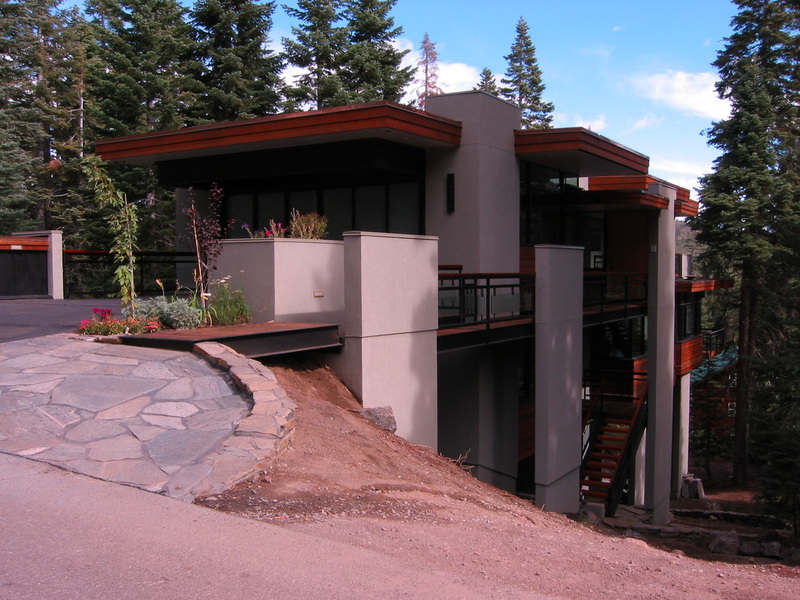 Redwood siding and reinforced cement/plaster frame wall encased with redwood and opaque glass opens electronically to a spacious, heated two-car garage finished to residence standards. Doubling as an air lock entry for the owner, it is fully insulated with dual paned windows and has a poured stained black concrete floor, storage cabinets and view windows with Cherry sills. 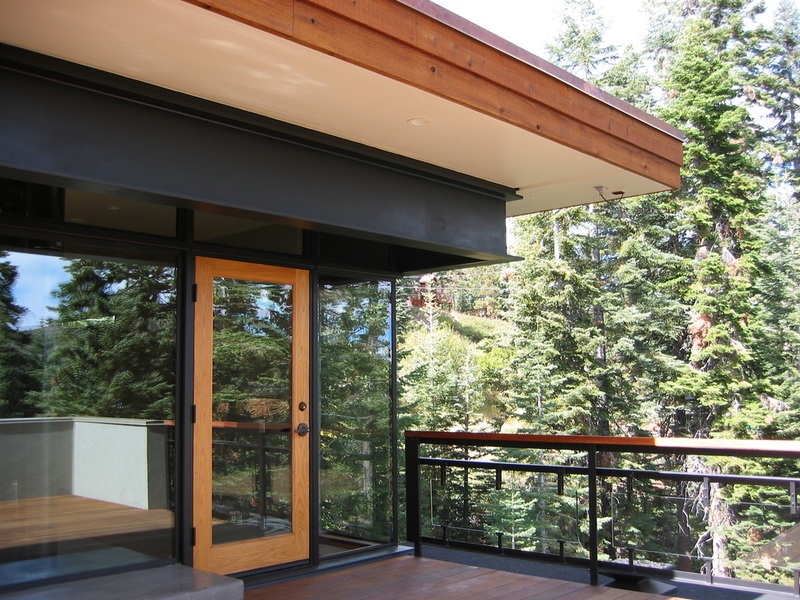 An entry bridge lined with steel and glass accesses the front door and foyer with views to the mountains beyond. 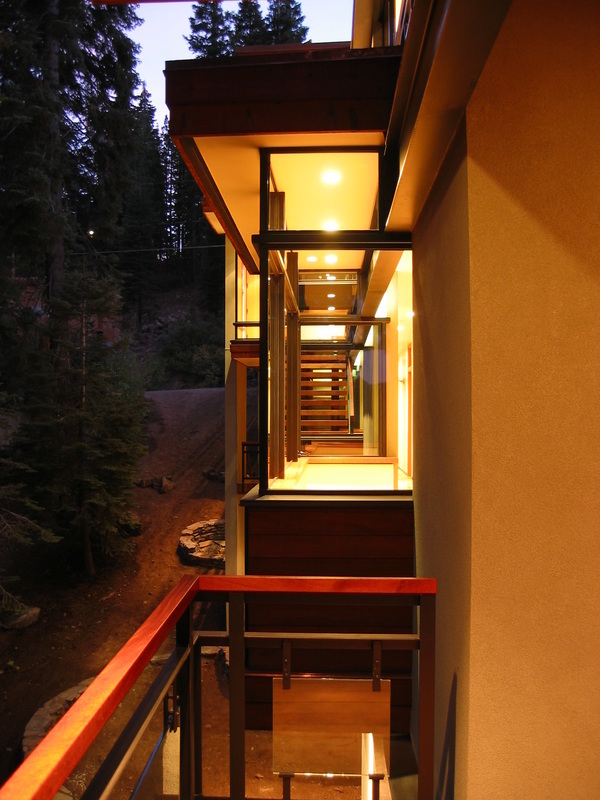 Descend the Cherry-clad stairs to the great room with vistas on three sides. The gourmet kitchen features stainless steel Kitchen Aid appliances, including warming drawer, compactor, dishwasher, microwave and contains a double sink, and there is a prep bar/sink with disposal under open shelves and cupboard. Cherry cabinets with poured concrete counters and full-extension European hardware are set in steel frames, floating above the Tasmanian Oak floor than turns throughout the great room. An under-stair TV hookup provides entertainment, with room for a sofa for kitchen viewing. The dining area is positioned between the kitchen and living/media room and has a Skan 5 woodstove facing the living room. 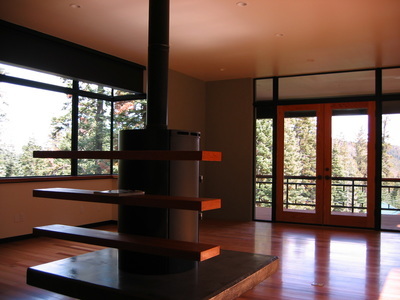 French doors lead to a spacious covered redwood deck that is plumbed for a gas barbecue and wired for a hot tub. Adjacent the kitchen is a laundry room/pantry with laundry chute and sink, and a guest half bath. To the rear are two guest bedrooms and a full bath tiled in white with floating Cherry cabinets and poured concrete counters and under counter sinks. The bathroom floors are poured stained concrete, and two guest bedrooms are carpeted. Transom glass above bedroom walls and doors provide complimentary light to view windows. From the foyer, three steps lead to a gallery hall with coat closet and master suite that occupies the upper level. The spacious room includes a sitting area, built-in Cherry wardrobe and entertainment center, a Skan 3 wood stove with poured concrete floating hearth (also plumbed for a gas stove), Tasmanian Oak floor and doors to an open redwood view deck. The master bath has a built-in valet above a Cherry cabinet for hanging clothes for the day, a Jacuzzi tub, white tile steam shower, Toto and Grohe fixtures, floating steel-framed Cherry cabinets with poured concrete counters, under counter sinks and poured concrete floor. A door to the finished garage provides convenient access for the master suite. Located in the town of Truckee California, approximately 3 hours from San Francisco and less than an hour from the Reno Tahoe International Airport. Squaw Valley, Alpine Meadows, Sugar Bowl and North star skiing are within 30 minutes. Donner Lake is 10 minutes away, and Lake Tahoe and North shore gaming are within 30 minutes. Shopping, services and a good selection of restaurants are within 10 minutes. Tahoe Donner offers a ski hill, cross country center, equestrian center, 18-hole championship golf course, driving range, two swimming pools, tennis courts, recreation center, two clubhouses, a restaurant, delicatessen, RV/boat storage and Donner Lake private beach, clubhouse and pier. Below the living levels, accessed by covered outside stairs, is a 225 sq ft mechanical room that can double as a workshop. Three-coat plaster towers of fire-retardant cement/fiber are protected with powder coated 11-guage caps. Authentic smooth coat finish over 5/8" sheetrock with 1 hour fire retardent rating. Alarm system with 4 camera locations, set-up for call-in, freeze-alarm, and camera "pet-proof" monitoring. All deck screws are plugged, sanded and stained. Grohe Master Fix shower faucets; Speakman mixers and shower heads, Toto toilets; Jacuzzi master tub, Thermasol Steam Shower. American Standard fixtures and Porcher sinks, Hansa faucets.